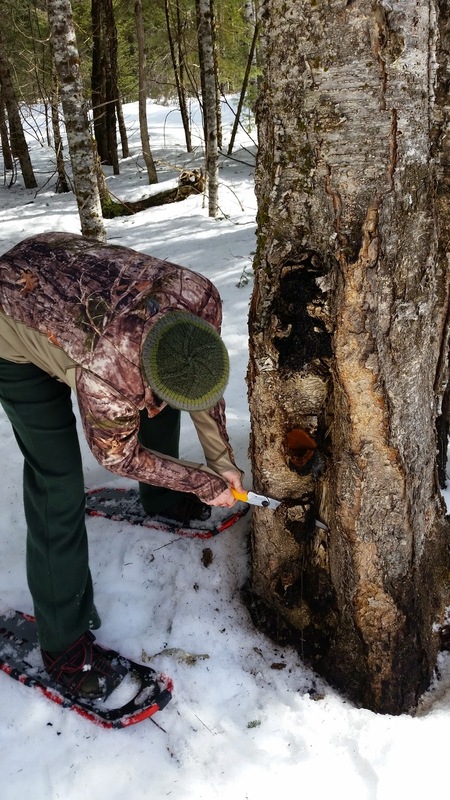 If you were out in the woods and saw this, would you be able to know it was chaga right away? I was lucky that I had Robin with me and she was able to point it out with 100% certainty of what it was. She was also on top of things and brought a saw to get it off the tree. It was a beautiful, somewhat windy day and we got out in snowshoes before it got too sloppy and slushy. It was almost hot when the wind died down. We took two pieces off of the tree and went in search of more, which we did not find. I am hoping to keep working on my ability to identify this in the woods when I am out now but it may take a time or two before I am totally confident in my finds. Erin that's interesting. What exactly is Chaga? Time for a spot o' tea?